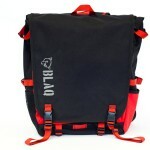 Blaq Bags recently set up shop in SE Portland. They caught our eye with their light up bags. That’s right! Bags with built in lights! They’re going to customize one for us. We’re absolutely giddy with excitement.